Hammers Steamair: forging and stamping. Forging - with impact energy of 240 kJ for performing the forging, precipitation, extraction, piercing, cutting, etc. Stamping - with impact energy of 125, 200, 310 kJ intended for the manufacture of forgings such as bodies of rotation and asymmetric parts (gears, flanges, fists, crankshafts, etc.). Dimensions of parts processed on hammers, limited parameters specifications. These hammers - machines in which the heat energy of steam and compressed air are converted into energy impact. 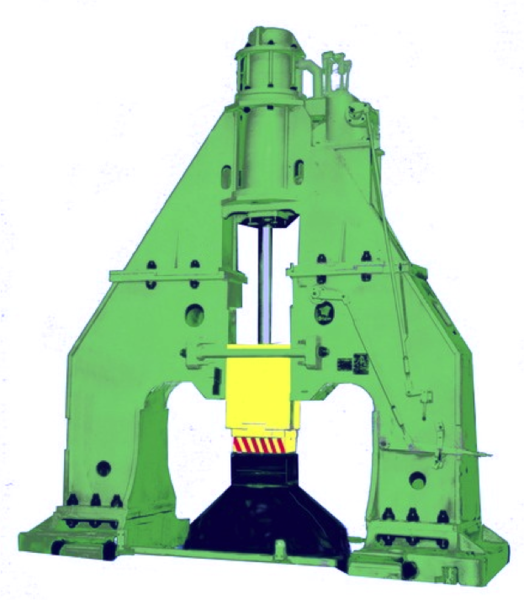 Hammer consist of shobota, housings, falling parts, cylinders, control systems and lubrication. Manage hammers - by servo. Pedal control - portable, can be removed depending on ubodstva service.